Kalapa Valley is a Shambhala pilgrimage site and sacred park. In 1979 the Druk Sakyong, Trungpa Rinpoche, recognized the valley as Kalapa, Shambhala’s capital. Sakyong Mipham Rinpoche has proclaimed Kalapa Valley the Sacred Centre of Shambhala. Kalapa Valley is open the general public who wish to visit during daylight hours. Please only drive in as far as the barn and park there. 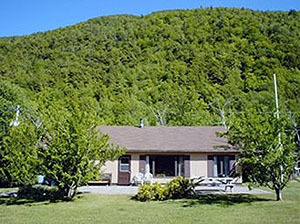 Rental of the house is restricted to current dues paying members of the Shambhala community who have completed Enlightened Society Assembly. Those who don’t meet these prerequisites must ask a senior member of the Shambhala community to accompany them on an overnight stay. Exceptions to the prerequisites may be directed to the Director of Kalapa Valley. The house, camping sites, and hiking trails invite overnight, week-long and day pilgrims to enjoy the peaceful and powerful simplicity of this woodland valley. To book a camping site contact the Director.